That ONE tweet makes the whole few years Iv’e been on there worthwhile. I am looking forward to getting this prize and seeing what I can do with it, I do have a few ideas and also what I said in the tweet that won it, as seen in the tweet you see here… one other thing I can enjoy is ebooks, as good as a kindle really, (like kindles? look at the sidebar!) >> 😛 – as you can do more with it, I read alot, so this will be great at times when I am not doing anything, on the bus for example. … I will do a review of it here, and depending on the set up, IE I imagine (fingers crossed) I get a box.net account loaded onto it too, which will be great for the all important files I can share with it, photos etc I can then do a double review… one of the product and one of what is loaded on there I find useful. I have the free box.net account already I am sure. 🙂 I will share my experience with box.net’s great tools, I think it’s something I should have used before really but never had the chance to dive into it, that will change. What is Box.net? A file storage and sharing set up, it could even be used for FTP, which is what you use to upload files to a website etc. 🙂 Ideal for the blogs if needed. Cloud storage as it’s called, IE nothing needs to be stored on your pc / lappy, which means you can access it on ANY device you use, a friends lappy for example, just log in and use, one good thing is you can use it for big files, sometimes files can be to big for email say, so you upload it to Box.net and share the link, ideal. Obviously there are limits with the free accounts, which is worth having, but should you need more, or unlimited even then that is possible. wow this is so cool. enjoy your new samsung galaxy tab. Wow, how lucky are you the Samsung galaxy tab looks one fantastic little gadget. I never win anything, but like the old saying go’s you need to be in it to win it. I really do need to start entering more competitions. I’m thinking about getting either a Samsung galaxy tab or an Apple iPad, and I can’t decide. I have heard good things about the both of them so I’m a little stuck. I’m looking forward to reading your review on it so I can finally decide if the Galaxy Tab is for me. Thanks a lot for sharing, and I hope you get your prize soon. I am choosing 2 from Android or Samsung Galaxy on which is better and easy to use. After I read this post I was thinking on getting a Samsung Galaxy. Let me try this one and I hope I can win this. Need all the luck for me. 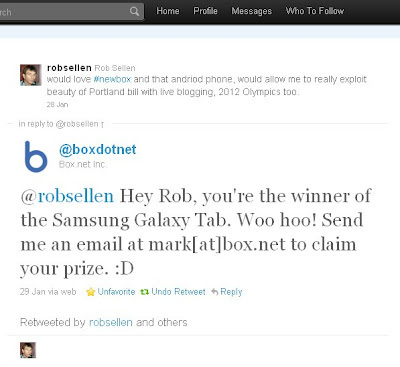 Congratulations on winning the galaxy tab. I’m extremely jealous now lol. I’ve been eyeballin that thing for about 2 months now. I have an iphone so I’m not familiar with the Android platform but I’ve heard some really good things about it. Everyone and their momma seems to have an Ipad these days so I’m pretty interested in something different. Also the fact that you can make phone calls from it is a big plus.